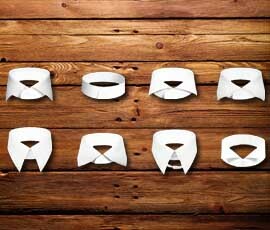 How to choose the right dress shirt collar? Sophistication in thoughts cannot be force but sophistication in personality can be infused for sure. How? Just dress accordingly. And, nothing shouts out sophistication more than a suit. Alright, alright! Yes, it’s true that how you dress down the suit matters a great deal too. But hey, that is almost a no brainer, no? Now, the most favored partner to go with any kind of suit is a matching shirt. But, how do you decide which shirt to pick? Choosing a color is easy, choosing the pattern is easy, but what about the collar style? For those who never gave a thought to the last part ever before, this is the reason why sometimes even after picking the right pattern, right color and right contrast something feels amiss. The collar is the most striking feature of a shirt. So, a poor choice of collar can wash out all the hard work and time you put into your bespoke suit. The forward point collar is the most basic of all and goes well with both casuals and formals. This type of collar is pointed and is separated by a small gap cut using straight lines. It compliments all kinds of lapels and works its charm in all kinds of events- weddings, gala, office meetings. When you are looking for a super sophisticated and formal choice, nothing beats a cutaway or spread collar. However, one thing to always remember is that you cannot and must not go tie-less with this type of collar. The button-down collars are the least formal of all. These type of collars are directly connected to the shirt using two small buttons. The spread width varies so you get to choose from a great deal of variety. So, the next time you need to rock the casual look, the button-down collar is your best option. The wing tip collar has proved to be the best wing man for tuxedo. It is specifically designed to carry bow ties with elegance, and hence are seen as the most formal of all type of collars. The tab collar is the smaller sibling of the forward point collar, and oozes out tradition. The main purpose of tab collar is to promote the tie knot and works best with the ‘four-in-hand’ tie knot. Again, never go tie-less with this collar. It is one of the rarest yet most classic collar types of all times. Pair it with a small horizontal metallic pin across the spread and you will get my point. So, here you go, mate! Whatever your style is, pay a little attention to the shirt collar type you pick and see your charm increasing up to tenfold.